The Fruitvale BART station has been closed due to an ongoing protest in Oakland this evening, according BART officials. Protestors marched in both Oakland and San Francisco again this evening in response to a Wednesday grand jury decision not to indict a New York City police officer in the death of Eric Garner, an unarmed black man who died after being placed in a chokehold. The protest in San Francisco wrapped up after a group staged a “die-in” on Market and Powell Streets and then marched to Union Square and along Market Street. In Oakland, a group of several hundred people set out from 14th and Broadway in downtown Oakland. While some protestors split off along the way, the bulk of the group traveled down International Boulevard. Oakland police declared an unlawful assembly around 9 p.m. after stopping a group of protestors at International and 22nd Avenue. Police stopped protestors there and then began letting them out a few at a time, splitting up the group. The group, which by then had diminished to around 50 people, then marched to Fruitvale Station, where they had a moment of silence in honor Oscar Grant, an unarmed black man shot to death there by a BART police officer in 2009. 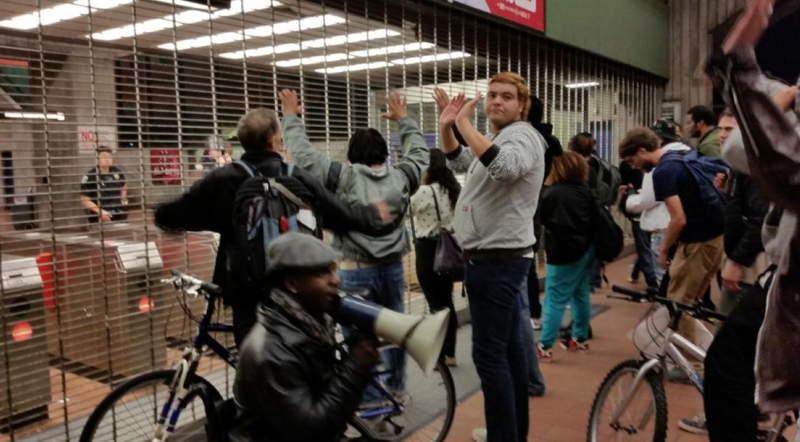 The station has been closed in response to what BART officials called a civil disturbance. 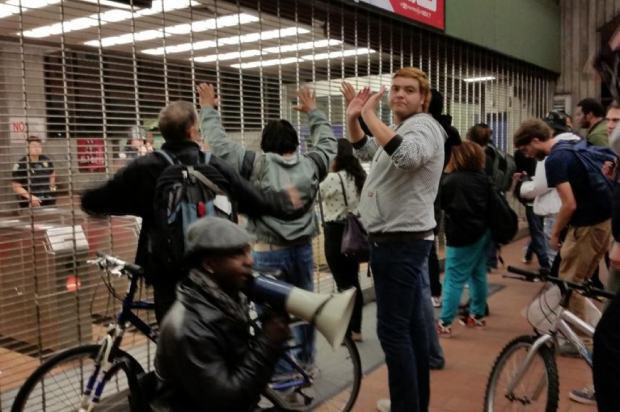 Earlier this evening, BART officials partially closed the 12th Street station entrance in Oakland for more than an hour due to the protest, and AC Transit rerouted buses around the downtown area. One protestor, Sophia Smith of Oakland, said she was protesting because she has a 14-year-old son. “He’s growing into a man, and every day I fear for his safety,” she said. Last night’s protests remained peaceful with few arrests, in contrast to protests last week in response to a similar Missouri grand jury decision not to indict a police officer in the fatal of Michael Brown, an unarmed black teen. Oakland resident Ben Lynch said that there is still time for a conviction for the police officers who killed Garner and Brown. “It’s sad that we can’t even say we have equal application of the law in a democracy,” he said. “The system is working the way it’s designed, which is to not provide freedom and opportunities for black people,” McBride added. Deja Lyons of Oakland said she had been harassed by police and stopped by officers looking for a robbery suspect. In San Francisco, Market Street was briefly closed at Powell Street due to a “die-in” protest and buses were rerouted around the area, according city transit officials. Market Street has cleared and traffic resumed as protestors moved out of the street, transit officials said. A similar protest at Powell Street last night shut down Market Street for more than an hour. Oakland police made a total of 169 arrests last week as freeways were blocked, fires were set, windows were broken and businesses were looted. San Francisco also had several protests last week including one on Black Friday in which store windows at Union Square were smashed and several police officers injured. Police reported arresting at least 79 people during the Black Friday protest.